For Migratory Birds, Lebanon Is A 'Black Hole' Where They Are Hunted, Trapped, Killed Every year, some 2.6 million birds are shot or die after being trapped in illegal nets in Lebanon. "This country is a black hole in terms of protection," says a conservationist. Axel Hirschfeld looks at the remains of dead birds while holding a Levant sparrowhawk. The bird was found locked in a small enclosure without food or water in a field used by poachers in the town of Ras Baalbek, Lebanon, in September. In an orchard in Lebanon's Bekaa Valley, Axel Hirschfeld, an activist with the Committee Against Bird Slaughter, carefully untangles the delicate wings of a young blue-gray bird from a poacher's net. Behind him, two Lebanese police officers rip down swaths of illegal mesh, hung between pomegranate and apple trees by the orchard's owner to ensnare thousands of these birds. "This is a juvenile shrike on her first migration," Hirschfeld says, holding a songbird in his palm and using a penknife to gently cut away the plastic webbing that traps the bird's spindly legs. "This bird will have started her journey in Europe, traveling for thousands of miles on her way to Africa, before getting caught here." 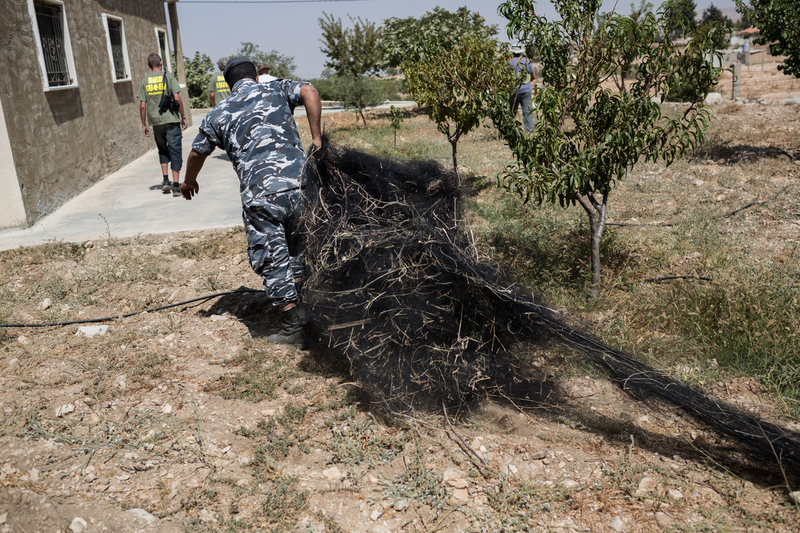 A policeman removes the remains of a poacher's net in Ras Baalbek in September. Every year, some 2.6 million birds are shot or die after they are trapped in illegal nets, according to the Society for the Protection of Nature in Lebanon. Among them are endangered, vulnerable and near-threatened species. Some poor farmers catch birds and sell them to restaurants or shops. For the hunters, shooting birds is a competitive sport and a cultural activity — something many Lebanese do on weekends, for fun. The repercussions are felt far beyond the country's borders, because Lebanon lies on the African Eurasian flyway, one of the world's most important migratory routes for birds, including protected species such as honey buzzards. An estimated 2.1 billion birds migrate between Europe and Africa every year. 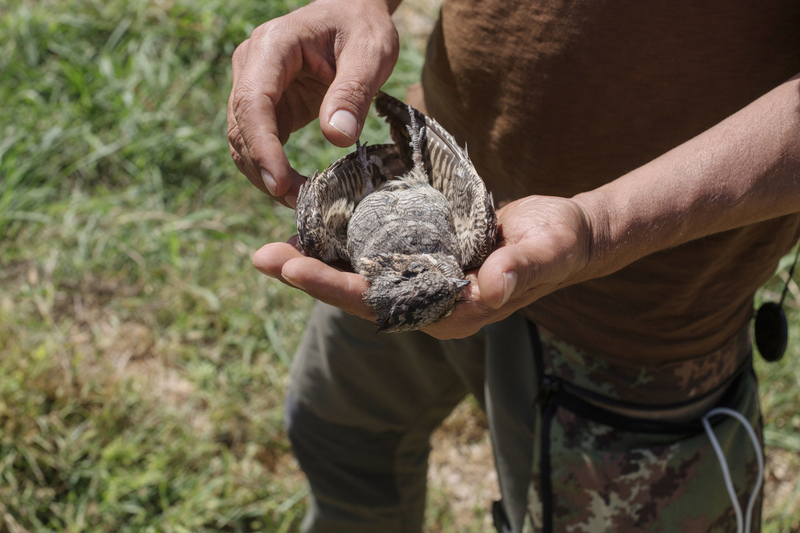 Filippo Bamberghi, a volunteer with the Committee Against Bird Slaughter, holds a dead nightjar, which was caught in a poacher's net in Ras Baalbek. Bamberghi said that the net was meant to catch small songbirds, and poachers discarded larger species such as the nightjar. "In Europe, governments invest a lot of effort and tax money to protect the last remaining pairs of several species," says Hirschfeld. "For example, many lesser spotted eagle nests are guarded on a 24-hour basis to make sure nothing happens to them. But as soon as they leave to fly to the wintering grounds in Africa, they have to cross Lebanon. And unfortunately, this country is a black hole in terms of protection." 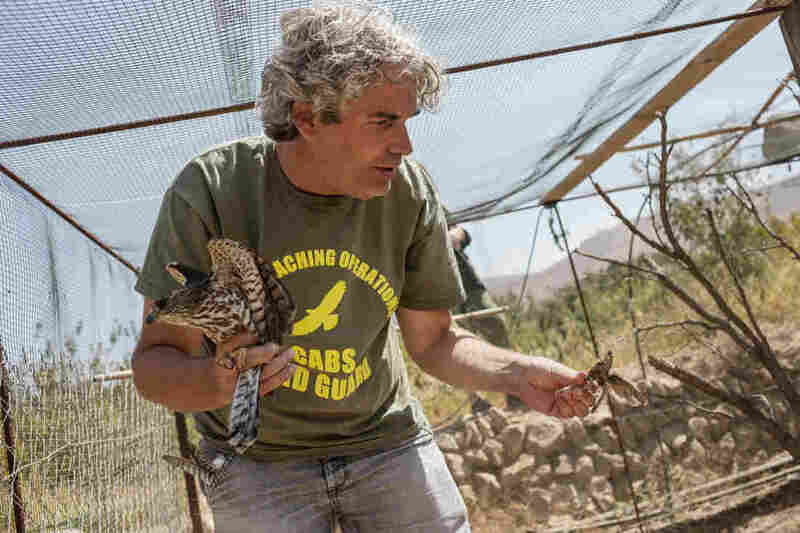 Hirschfeld spoke with NPR during a visit to Lebanon in September, when he and other activists from the Germany-based organization were documenting the effect this small nation is having on the world's avian population. The group has been traveling around the world, tracking poachers, sometimes chasing them for days until they can corner them and call police. "We are activists, not birdwatchers," says Hirschfeld. From left, Committee Against Bird Slaughter members Lloyd Scott, Geraldine Attard and Filippo Bamberghi examine a poacher's net in Ras Baalbek. On the day NPR joined them, the activists, working alongside the local Middle East Sustainable Hunting Center, used powerful binoculars to scour the towns and orchards in Lebanon's Ras Baalbek area. Spotting the net set up in the Bekaa Valley orchard, the group called police. Nets that trap birds are considered illegal hunting materials. Those who hunt without permits, use illegal hunting materials or kill certain bird species are subject to fines and sometimes even prison sentences. But the laws are not well enforced. Police officials seemed puzzled at first by the phone call from the bird activists. In a country that has dealt with a wave of suicide bombings in recent years and works to contain fallout from the civil war in neighboring Syria, the protection of birds is not necessarily at the top of a security officer's list of tasks. Once notified, however, the police led a raid into the orchard. Running across a field, jumping over a ditch and scaling a barbed-wire fence, NPR and the activists followed the police into the private property. 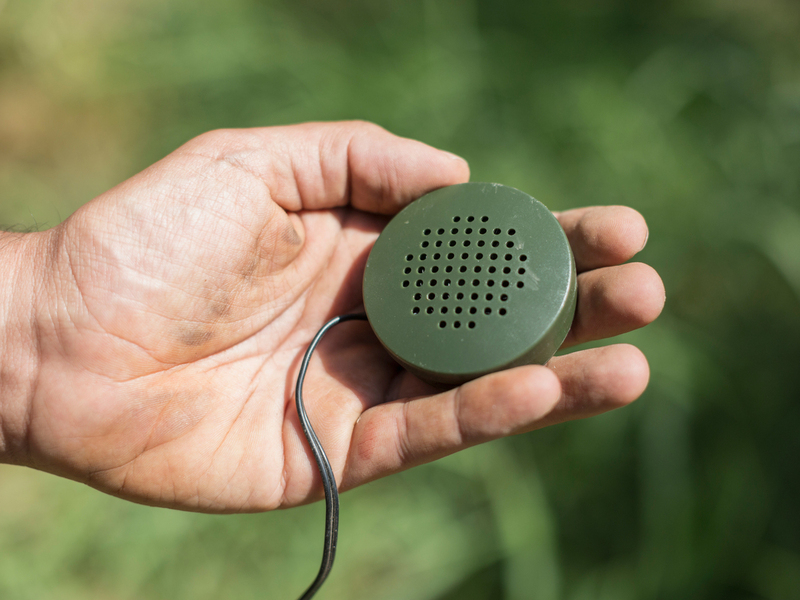 An electronic device in the nook of an olive tree branch emitted the mating call of the blackcap songbird, luring the small birds into netting that covered and crisscrossed hundreds of trees. (The orchard owner was later fined). A lure attracts songbirds into a poacher's field in Ras Baalbek. Songbirds are considered a delicacy in Lebanon, and are often sautéed and eaten with pomegranate molasses. "It's so cheap and easy. The birds won't see the net, and when they are caught, the net owner will crack their necks to kill them," said Sherine Bou Raffoul, the director of the anti-poaching unit in the Middle East Sustainable Hunting Center, working alongside CABS. "After that, they will sell them to restaurants — each bird for one dollar." 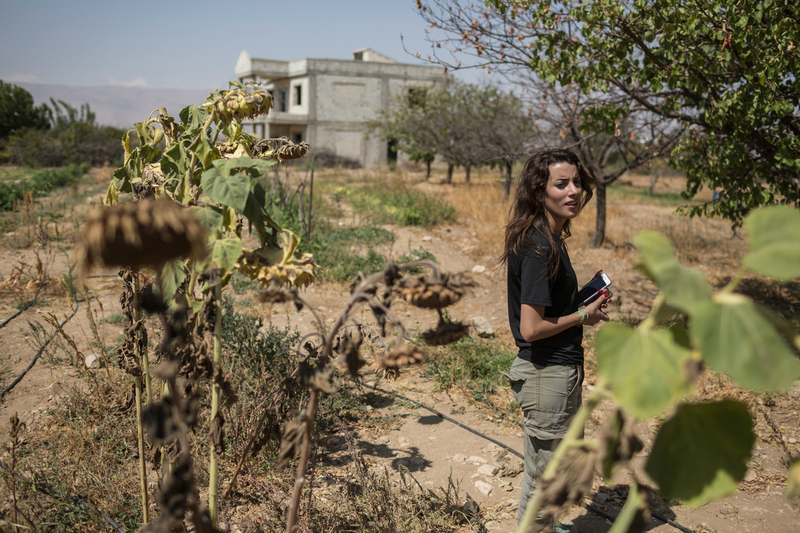 Sherine Bou Raffoul, director of the anti-poaching unit of the Lebanon-based Middle East Sustainable Hunting Center, stands in a field used by poachers to trap songbirds in a large complex of nets. Dressed in khaki camouflage, with flowing hair and immaculate, red-painted nails, Bou Raffoul is also a hunter of birds. She says she wants to protect migratory birds because nets and uncontrolled poaching are ruining the sport she loves. She believes hunting is only acceptable within constraints that don't ultimately harm the overall population of each bird species. "As hunters, it breaks our heart to see this trapping and killing [of] so many birds," she says. "We can go hunting, but without hurting nature — we should respect the laws." Sherine Bou Raffoul frees a young red-backed shrike from a poacher's net. One of her colleagues, a tall man in his mid-40s who asked not to be named as he goes undercover to expose and identify poachers who violate hunting laws, says not enough hunters share this respect for the law. "Most people don't care," he says. "They have a shotgun and if they see something moving, they shoot at it." The consequences of nets and poaching are proving devastating, conservationists say. Lloyd Scott, a campaign and operations officer with CABS, says the global population of honey buzzards is around 400,000. But "in the last seven days alone, we've found the remains of probably 1,000 of these birds in just one bottleneck in Lebanon." These "bottlenecks" are areas that migratory birds must pass over. Scott estimates there are about 30 bottlenecks in Lebanon. Many of the larger birds rely on air currents known as thermals that set them on a particular route. Hunters drive to the tops of hills and mountains and wait with their guns for the birds to soar overhead, engaging in a popular pastime. "The United Kingdom has between 80 and 100 breeding pairs of honey buzzards," says Scott. "So we're seeing, in just one bottleneck area in Lebanon, in the space of a couple of days, the [equivalent of the] entire breeding population of the U.K., just killed." 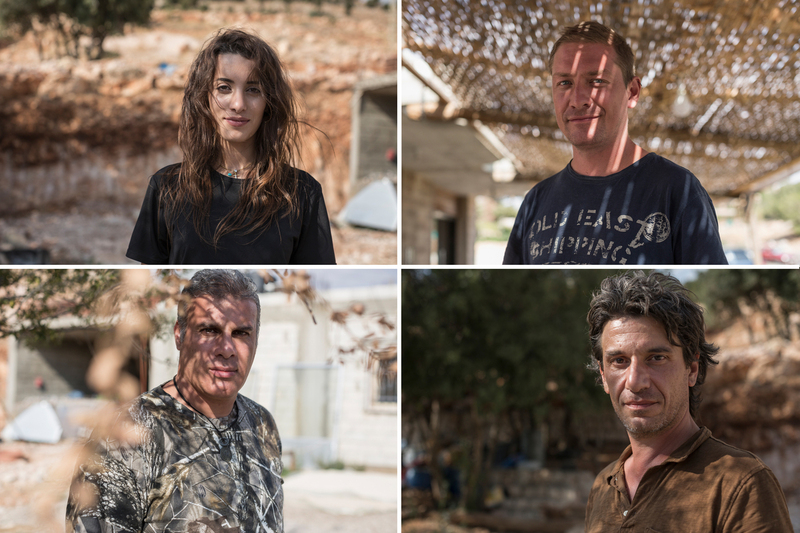 Clockwise from top left: Sherine Bou Raffoul, director of the anti-poaching unit of the Middle East Sustainable Hunting Center; Lloyd Scott, from England, a volunteer for the Committee Against Bird Slaughter; Adonis Al Khatib, director of the Middle East Sustainable Hunting Center; and Filippo Bamberghi, from Italy, with the Committee Against Bird Slaughter. The day before meeting with NPR, the activists had spent hours tracking and chasing down a poacher who was shooting honey buzzards, presumably for sport. "It can be really dangerous work," says Bou Raffoul. "This time we chased the poacher and then, eventually, we cornered him in a driveway — putting our car in front of his so he couldn't go anywhere." They notified police, and found "it was clear the man didn't have a license for his guns. He had three dead honey buzzards in his car. He actually shot 10, but their bodies fell into the valley. So he was just killing them and could take them." In a letter last year, 58 organizations, including environmental groups from 30 countries in Europe and Africa, appealed to the Lebanese government to enforce the protection of this important bird crossing. The cause has the sympathy of the Lebanese President Michel Aoun. In 2017, as he announced his intention to enforce hunting laws more firmly, he declared that "there should be a peace treaty ... between man and birds." But the challenge, say activists, is changing the Lebanese mindset. Even if people do want to follow the law, the undercover activist says, most hunters in Lebanon don't know how to identify endangered species. "In trying to change mentality," he says, "we're not just swimming against the current — it's like swimming against a full-blown tsunami!" 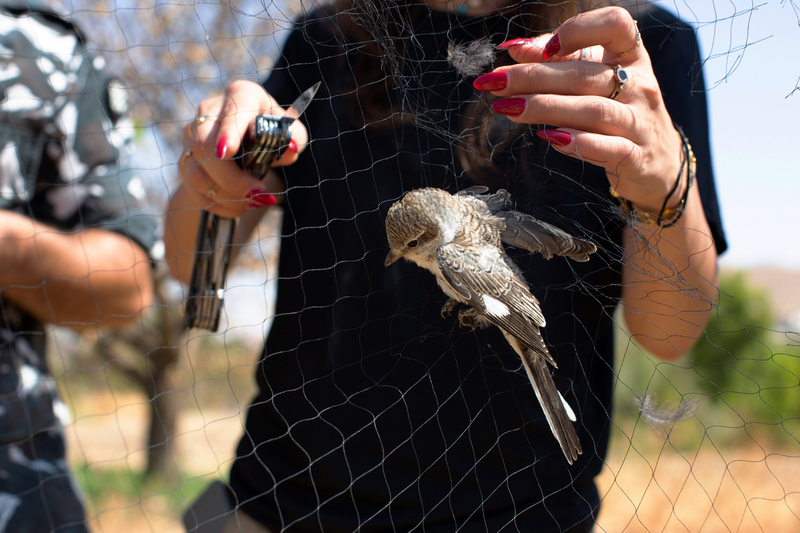 Sherine Bou Raffoul and Axel Hirschfeld release a young red-backed shrike that was caught in a poacher's net.